This wrongful death claim was filed in Baltimore County after a woman's breast cancer metastasized to her clavicle and went untreated. This breast cancer misdiagnosis claim was filed in Maryland Health Claims Arbitration on March 27, 2018, and it is the 144th medical malpractice case filed in Maryland this year. A woman was diagnosed with stage III breast cancer, requiring a left mastectomy. After two years of treatment, the woman's PET/CT scans were determined to be negative for metastatic disease. She continued to undergo oral chemotherapy. 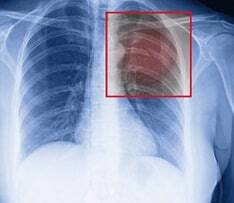 Five years after her negative PET/CT scan, the woman underwent another scan that showed a lesion on her clavicle. Unfortunately, the radiologist failed to realize that the clavicular lesion was a new finding compared to the woman's earlier imaging results. He also misinterpreted the image, reporting that the lesion was located in a bone joint and was likely related to arthritis. In reality, this single lesion (called solitary bone metastasis) was located in the bone marrow, making metastasis the most likely diagnosis. The woman's oncologist also reviewed the abnormal imaging results and failed to take any follow-up action. After such concerning results, the woman should have undergone tissue sampling and a biopsy of the new clavicular lesion. Instead, she was never informed about the potential metastasis. After another three years passed, the woman presented to Franklin Square Hospital Center with pain in her right shoulder. Subsequent x-rays, CT scans, and a bone scan identified an aggressive malignant bone lesion on her right clavicle. A biopsy led to her definitive diagnosis of metastatic cancer, which had spread from the primary site of her breast cancer. The woman underwent aggressive treatment over the next year, but she ultimately died as a result of her metastatic disease progression. Breast cancer is an all too common malignancy in women. Thankfully, the death rate from breast cancer has fallen in the U.S in recent years doctors are diagnosing breast cancer earlier. This is due to both increased patient awareness and the breast screening programs. When breast cancer metastasizes, it frequently metastasizes to bone. Breast cancer is the tumor most often associated with metastatic bone cancer. Solitary bone metastasis means the woman metastasis was limited to a single skeletal lesion that originated from her breast cancer. If the scan reads as plaintiff's experts suggest, it is going to be hard to get around malpractice. If this is the case, this claim will likely be fought on causation. Plaintiff's expect contends that the victim would have lived for 7 years if the patient had been correctly diagnosed. The expert will need to explain why this patient would have had a survival rate beyond the expected 30 months suggested by this study. How could the plaintiff argue that this woman would have lived longer? Women who have low histologic grade, positive estrogen receptor status, long postoperative disease-free interval, and lack of development of disease outside the skeleton are more likely to beat the odds and live much longer. Bone metastasis can lead to severe morbidity secondary to bone pain, immobility, pathologic fractures, and neurologic complications. Tragically, these serious problems can shorten survival. University of Maryland Oncology Associates, P.A. University of Maryland Community Medical Group, Inc. Failing to timely recommend tests, studies, procedures, and surgeries to manage the woman's serious medical condition. Failing to conduct thorough examinations, evaluations, and diagnostic testing. Failing to timely recognize, diagnose, and treat the woman's true medical condition. Failing to appreciate the significance of the woman's PET/CT findings. Failing to notify the woman and her treating health care providers about the significant changes in her medical condition. View sample medical malpractice verdicts and settlements from Baltimore County.